Wedding programs serve one main purpose. And that is to make sure that a wedding ceremony flows smoothly with the guests and the couple all aware of what is going on and what is expected of them. If you are planning a wedding, creating a wedding program should be part of your must-do list. In this article, we provide comprehensive information on what to write in your wedding program and how to use wedding program templates to make this job easier. There are a lot of reasons why wedding planners opt to use wedding programs. We have compiled a few of the most compelling reasons below. To organize the whole wedding event. Weddings take a lot of time, effort, and money to pull off well. And for those who want to ensure a smooth-sailing event, creating a wedding program may just be the solution. Wedding programs provide a timeline of the different micro-events that occur during weddings. For example, a simple wedding dinner program template card lets guests know when its time to take their seats for the dinner reception and when to head off to the dance floor. As a souvenir of the event. Wedding programs may also be used as a memorabilia for your own wedding. This is separate from the wedding invitation card that all your guests have already received. A wedding program may be used by the couple as a tool for reminiscing the events of their wedding day. Weddings can be hectic for both the groom and bride. They may not remember or be aware of the different things that occurred during that day. Therefore, using a wedding program for that day can be beneficial for the couple, too. To introduce guests to one another. Traditional wedding programs will include information on the guests who are part of the wedding entourage. For example, names of the couple’s parents, the wedding sponsors, the bridesmaids, the groomsmen, flower girls, and ring bearers and their relation to the couple will be printed on the wedding program. Guests who receive the program will then be able to identify these people—paving a way for them to eventually know each other. And since weddings are attended by both family members and friends of the couple, the wedding program serves as a shortcut for introducing them all to one another. To express gratitude to guests. In some cases, couples opt to create wedding program cards for their guests so that they will have a way of expressing their gratitude toward their guests and parents. It is in these event program cards that the couples write down their sentiments. Having a physical object to read and hold is also more memorable for both the couple and the guests. Printable wedding program template cards will often include a separate pre-written thank-you page coming from the couple. To save time, money, and effort. Another reason for creating and using a wedding program is that it helps the couple and their wedding planner save on their time, money, and energy that would have been spent in policing the entire event. 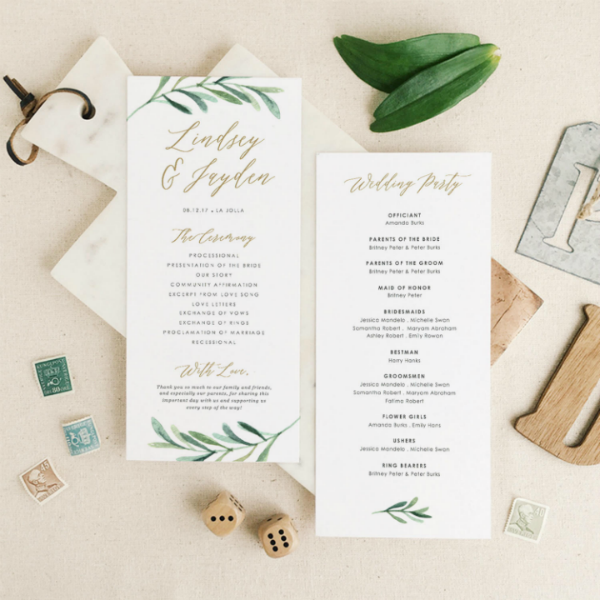 Without a wedding program card (and the wedding program template that is used to create it), wedding planners will be left to do everything on their end. But with a wedding program, guests are given the information about the wedding beforehand. They will know what to expect and, in effect, may not have to bother the already busy wedding planner that day. With the help of the different wedding program template designs embedded above, anyone will be able to create wedding programs efficiently. However, if you want your wedding programs to stand out, it may be best to incorporate the different guidelines we have listed below in addition to using the templates provided earlier. When creating a wedding program, the first design aspect that you should consider is how the wedding program will look like. In order to achieve a good-looking program design, you need to choose a card format and layout that will best showcase your wedding theme. 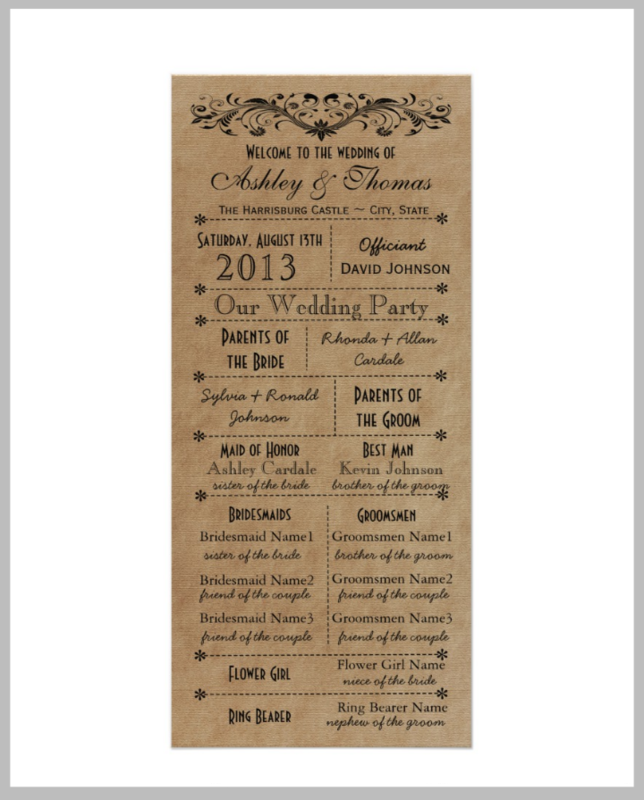 For instance, if you are having a vintage wedding theme, you may need to create a vintage wedding program template, too. On top of that, you also have to choose between one page, double-sided, or booklet form layouts. You will know that you have a good layout design when you can easily read the wedding details on the wedding program without being hampered by any design elements. The decorations on the program (like flower designs, pattern designs, and typography) should all work together in order to highlight the pieces of information on the wedding program. They should not overpower them. After deciding on a layout design, it is time to finally put your actual design skills to use for creating a front and/or back cover design for a wedding program. If you intend to create a single-page program, you will only need to create a cover design. The wedding program’s cover design will primarily depend on your wedding theme or motif. An example is a nautical themed wedding using a navy blue and gold wedding colors. Their wedding programs may make use of key nautical design elements like oars and wave patterns used as the program headers. These design elements will then be repeatedly used on other printable wedding cards. Some couples may also opt to feature their own photos on the cover of their wedding programs. This can be a good way to really personalize a wedding program. Different types of weddings will require different sets of information. For example, those who opt to have traditional church weddings may need to include an outline of the order of events that occur in a church wedding. On the other hand, if you are having a backyard wedding, you may opt to forgo these formal event lists. Some creative wedding program templates use an infographic and portrait design instead of having a text-heavy wedding program. 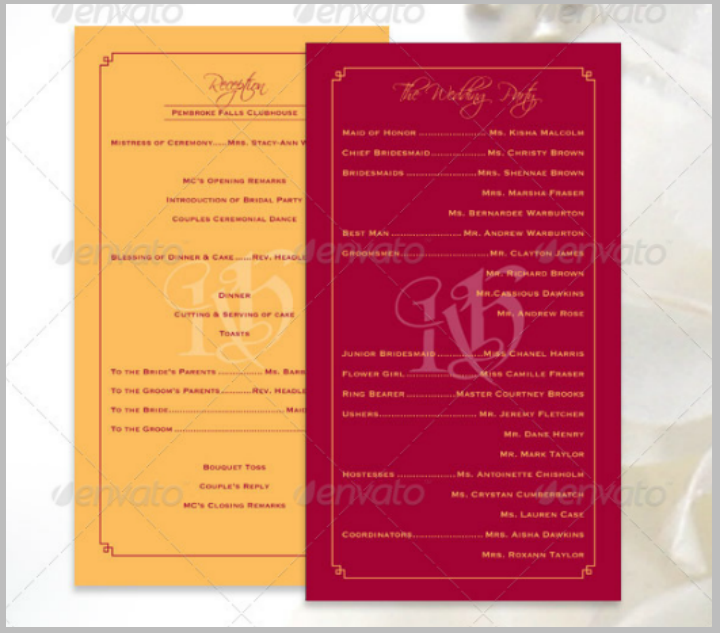 Wedding program templates should also include additional information that was not mentioned on the elegant wedding invitation template itself. 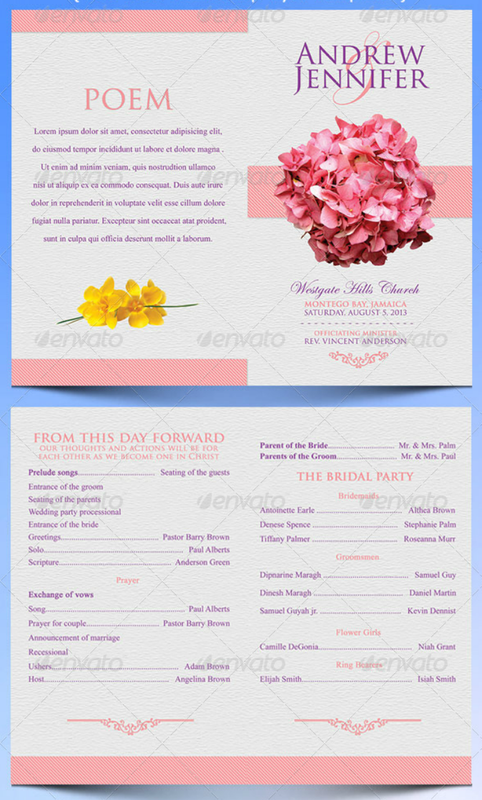 The most common content of wedding programs is the list of the wedding entourage. Depending on the type of wedding program that you want to have, there are various ways to present this information. For example, some wedding planners make use of an image-laden wedding program featuring the faces of the wedding sponsors, parents, bridesmaids, groomsmen, flower girls, ring bearers, etc. while other wedding programs may just follow the classic two-column list of names. Whatever you choose, select one that will best express your wedding’s theme. As mentioned earlier, most modern wedding program templates will include a thank-you page that is separate from the Thank You card designs that will be sent from the couple after the wedding. These pages are intended for the couple to write messages of gratitude to their parents, friends, sponsors, etc. who have made the entire wedding a success. 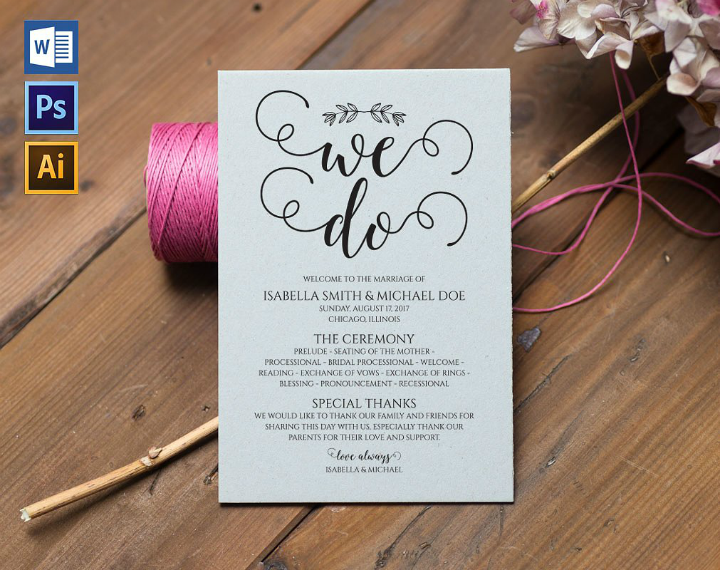 As part of the wedding program, thank-you pages should also be designed to look similar to the main pages of the wedding program card. When printing out wedding program cards, it is best to use paper or card stock that matches the other printed wedding materials. This way, there will be uniformity in the wedding printables. 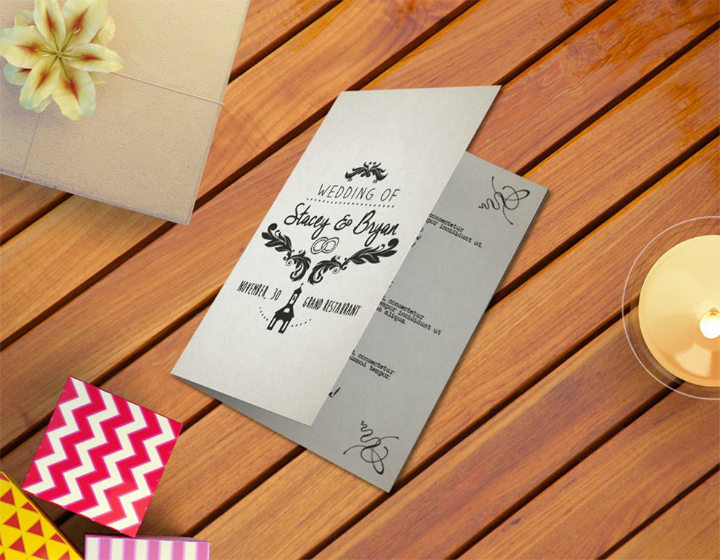 Some wedding planners will also suggest creative ways for printing these wedding program cards. 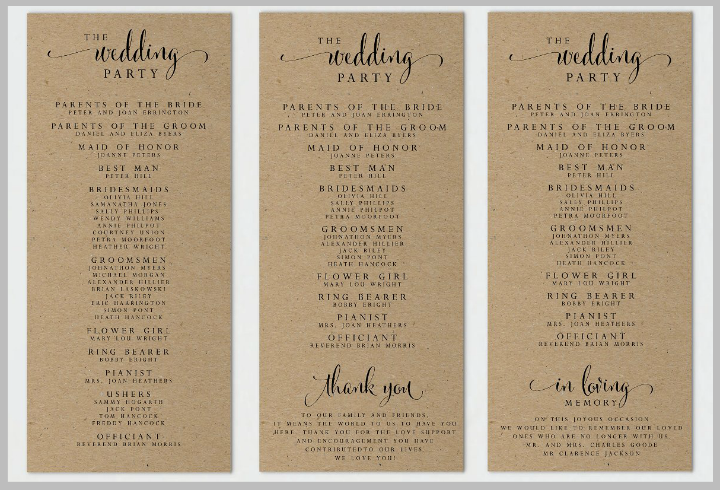 Unique examples are printing wedding programs on handmade fans, as booklets, or even as over-sized banner boards. 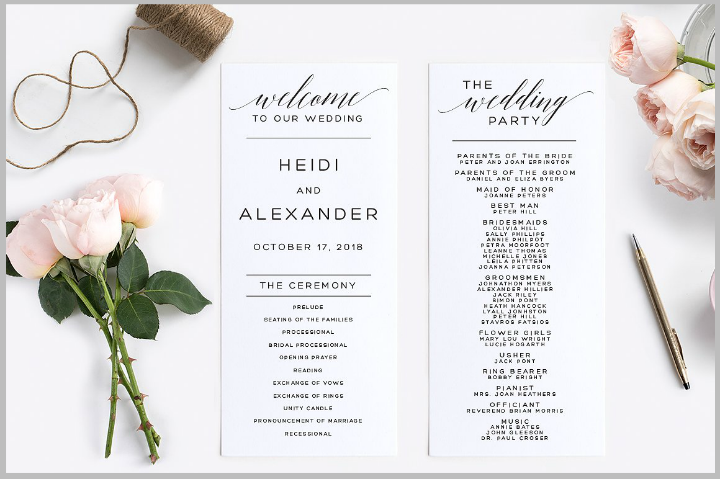 If you wish all guests to have a wedding program each, it may be best to use a wedding program template with a design that can easily be mass produced. On the other hand, if you wish to give out individual program cards, you may follow the more cost-efficient route of printing the program on banner boards. Printing it like this is like creating a banner ad, only this time, your wedding guests will be able to see and read them. Giving out wedding program cards is not a standard custom for formal weddings. But it has gained popularity in recent years thanks to the benefits it provides to both the wedded couple and their guests. It will be up to you (the bride or the wedding planner) to decide if you want the program included in the wedding invitation suite that is sent to the guests before the wedding or if you want the wedding programs to be distributed right before the wedding occurs. There are pros and cons to both options. If you choose to send it beforehand, you will not be able to make changes to the program, or if you make changes, the guests will become confused about the wedding’s order of events. On the other hand, if you choose to distribute the wedding programs right before the event, you will need to also organize the distribution party. To some, doing the latter is easier especially if they enlist the help of the bride’s friends. You may even designate some family members for this small task. 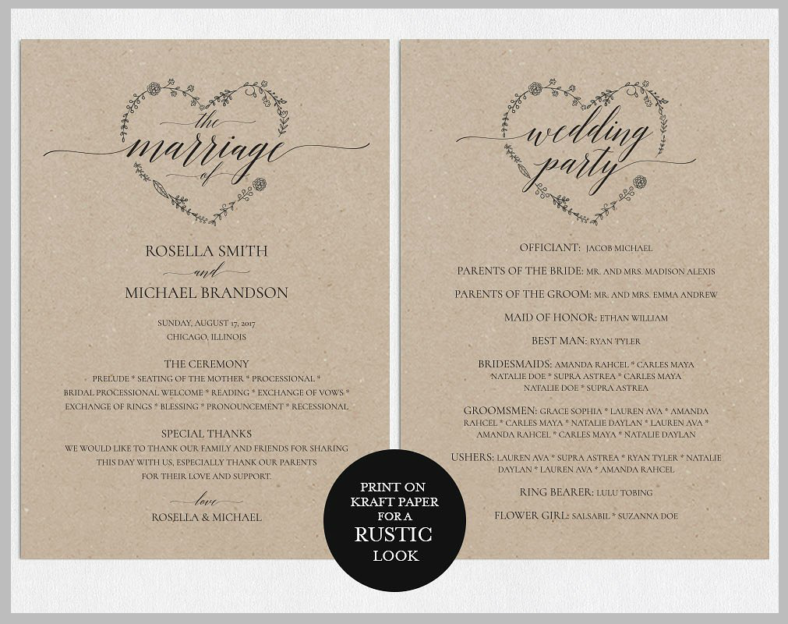 Which wedding program template to choose? In choosing a wedding program and invitation design, just remember what your main wedding theme and/or motif is. If you make a decision based on that, the subsequent choice for wedding program template selection will be easier.